This exhibit, organized by the Georgia O’Keeffe Museum in Santa Fe., N.M., with appropriate Hopi katsina dolls curated by the Heard, focused on O’Keeffe’s (1887-1986) experiences as she made New Mexico her part-time, later full-time, home, which inspired her as she expanded her visual vocabulary and broadened the concept of American Modernism. The Heard incorporated appropriate katsina dolls (katsina tithu) into the exhibit with interpretation from one of the exhibit advisors, Alph Secakuku (Hopi), who is the author of the Heard’s Following the Sun and Moon publication, said Dr. Ann Marshall, the Heard’s director of curation and education. “This is an opportunity for the Heard’s visitors to see O’Keeffe’s approach to subject matter taken up by Hopi artists past and present,” Marshall said. O’Keeffe began spending part of the year living and working in New Mexico in 1929, a pattern she rarely altered until 1949. She then made Northern New Mexico her permanent home three years after the death of her husband, celebrated photographer Alfred Stieglitz, who was America’s first advocate of modern art. O’Keeffe was inspired to paint and draw New Mexico’s distinctive churches, crosses, folk art, representations of katsina tithu (carved and painted representations of Hopi spirit beings, also called kachina dolls), as well as the astonishingly beautiful, painted desert that surrounded her Ghost Ranch house. During that first summer, O’Keeffe expressed the extent of her new experience in at least 23 paintings that depict an extraordinary diversity of subjects including architecture, landscape, and religious arts of the region. This exhibit included drawings and paintings of the architecture, landscape, and cultural objects that fascinated O’Keeffe and became part of her artistic practice as she explored a new environment and experimented with new colors, forms, and compositional strategies. Works in the exhibition date from 1929, the first year she painted in New Mexico, to 1953, the last year she used the area’s landscape forms as subject matter. Inspired by the distinctive regional identity, the landscapes in this exhibit are a familiar theme and represent O’Keeffe’s contribution to American Modernism during the 1930s and 1940s. Less familiar is the rich array of imagery that reveals the expanse of her initial curiosity about her new environment, and her sensitivity to the diversity of people and cultures of New Mexico. For example, she showed an immediate interest in the breadth of the vernacular architecture in the region. 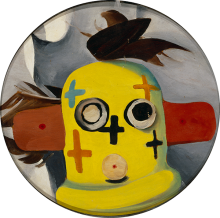 During this same period she painted religious imagery, including churches, Hispanic Santos and representations of Hopi katsina dolls. While the New Mexico landscape remained a prominent part of O’Keeffe’s life and art, especially after she left Taos to live and paint at Alcalde, Ghost Ranch and Abiquiu, very little has been known or written about her involvement with Native American and Hispanic art and culture. The paintings included in this exhibition bring to light the formal and cultural interests that drew O’Keeffe to New Mexico and sustained her artistic practice far from New York City. 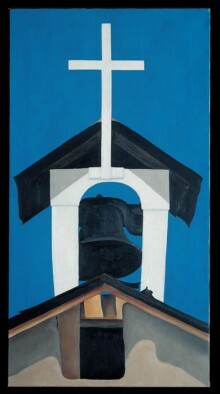 This exhibit was organized by the Georgia O’Keeffe Museum and the Montclair Art Museum and was made possible in part by the Burnett Foundation and the Georgia O’Keeffe Museum National Council. It was presented locally by the Marley Foundation, with support from SRP and Richard and Mary Anne Cree. 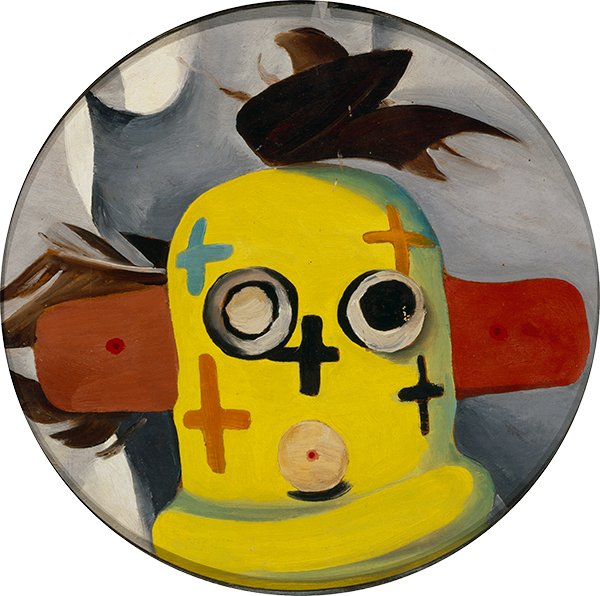 Georgia O’Keeffe, “Paul’s Kachina,” 1931, oil on board. Gift of The Georgia O’Keeffe Foundation (2006.05.134).